Today, I'm looking at director Howard Hawks' classic Western Red River (1948) starring John Wayne (left) and Montgomery Clift. This article is part of the Criterion Blogathon hosted by Criterion Blues, Speakeasy, and Silver Screenings. Here's a gentle reminder that this review contains spoilers. In postwar America, there were two types of Hollywood movies that reflected the turmoil of the atomic age. The first was film noir, while the second was the Western, a genre that transformed itself from Saturday matinee shoot 'em ups into a series of adult films that mirrored American's conflicted attitudes about race, nuclear war, and American imperialism. 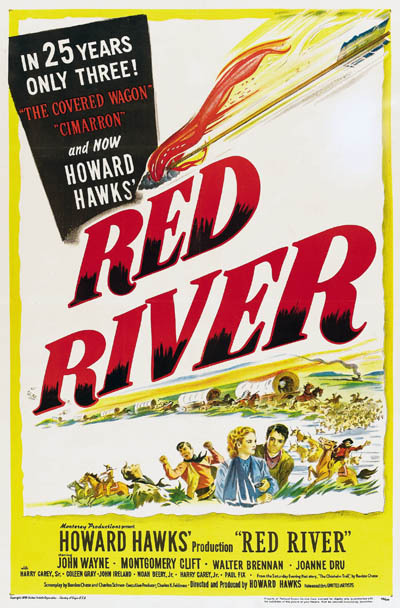 One of the best of these films is director Howard Hawks' Red River (1948), a timeless tale of patriarchy and generational conflict set on the Western plains. Red River tells the story of cattle rancher Thomas Dunson (John Wayne). After his sweetheart (Coleen Gray) dies in an American Indian raid, he becomes a hard and bitter man, only concerned with expanding his livestock empire along the Rio Grande. When the southern cattle market drys up after the Civil War, Dunson decides to blaze a new cattle trail to Abilene, Kan., where Dunson believes he can open up a profitable new market for his beef. What he doesn't know is that the long, hard journey north will deplete his livestock, and that his authoritarian leadership style will alienate his men and lose him the respect of his adopted son, Matthew Garth (Montgomery Clift). 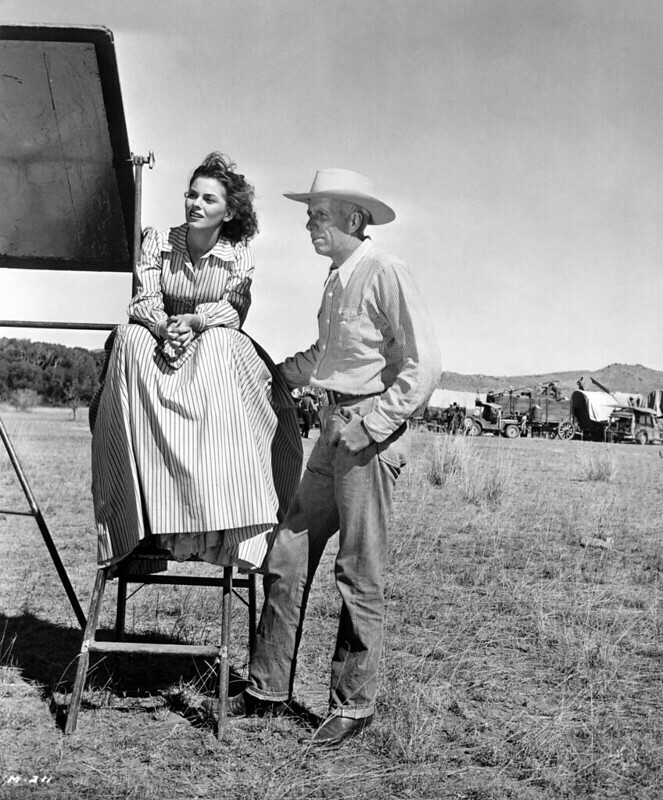 Joanne Dru and Howard Hawks on the set of Red River (1948). Red River is based on a Saturday Evening Post serial novel by Borden Chase called "Blazing Guns on the Chisolm Trail" (Chase's other Western tales would inspire three great Anthony Mann-James Stewart Westerns: Winchester '73, Bend in the River, and The Far Country). Hawks, who was already a highly successful director of screwball comedy (His Girl Friday), gangster films (Scarface: The Shame of the Nation) and film noir (To Have and Have Not, The Big Sleep) decided to use Chase's timeless story as the basis for his first Western. Red River is the most visually stunning of all Hawks' films. It was partly filmed on location in Elgin, Ariz., and Hawks, assistant director Arthur Rosson, and cinematographer Russell Harlan crafted a beautiful film that created archetypal Western imagery. The most memorable sequence is the stampede scene, which has been widely imitated but whose raw power has rarely been equaled. 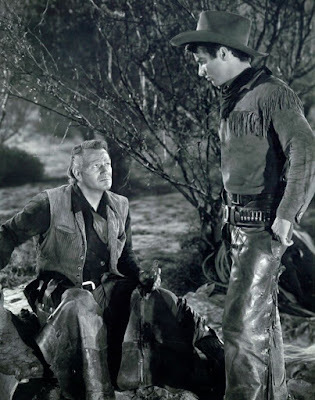 In fact, the stampede and many of the other outdoor scenes were directed by a second unit helmed by Rosson, while Hawks worked with the principal actors on a Hollywood sound stage ( Hawks generously gave Rosson a co-directing credit for Red River). 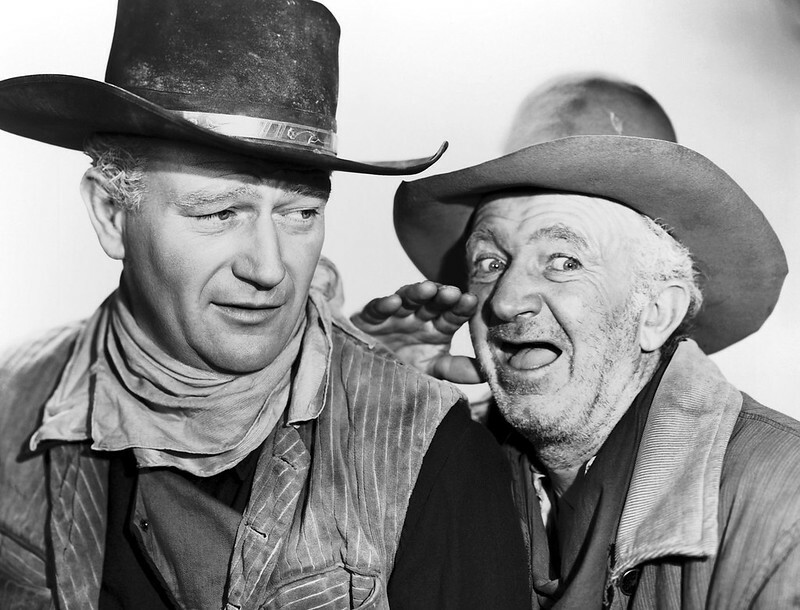 John Wayne and Walter Brennan in a publicity still for Red River (1948). Hawks had a little bit of trouble getting the right cast for Red River. He originally wanted Jack Buetel, who was so memorable as Billy the Kid in Howard Hughes' The Outlaw (1943), as Garth, but the ever suspicious billionaire wouldn't let the young actor out of his contract. Hawks then settled for Clift, an untested method actor who had impressed the director when he saw Clift on Broadway. Hawks had an equally difficult time finding the perfect Dunson. He wanted his old buddy Gary Cooper, but the actor refused to play a character that might damage his nice guy persona. Wayne was also reluctant to play the vindictive rancher, but Hawks finally convinced him by telling the prestige hungry star that he would win an Academy Award for Red River ( for the record, Wayne wasn't even nominated). Even without a trunk full of trophies, Wayne gives one of the most remarkable performances in American cinema. In many ways, it is Wayne's compelling portrayal of one man's obsession that is the driving force in Red River. Hawks pursues his trademark fascinations with male bonding, husky voiced women (in this case Joanne Dru, who plays seductive card sharp Tess Millay) and casting Walter Brennan in everything (he is in full, "gul-durn it" mode in Red River), but all of these things are pushed to the sidelines by the sheer power of the towering figure of Thomas Dunson. Wayne's performance is so monumental that Dunson becomes a mythic American figure, and Wayne was ever after the de facto symbol of American masculinity and authority. Even more than 30 years after his death, Wayne is still a powerful symbol of a certain type of patriotism, at least here in the Midwest, where his movies regularly sell out at Walmart, and John Wayne wall clocks are still prized possessions. Wayne could never quite escape Red River throughout his legendary career. In his best films, he often played versions of Dunson; sometimes, he was more benign, like the strong but sentimental Capt. Nathan Brittles in She Wore a Yellow Ribbon (1949), while sometimes he was troubled, like rancher Tom Doniphon in The Man Who Shot Liberty Valance (1962). He only surpassed his performance in Red River once: Wayne recreates the Dunson character as the Indian hunter Ethan Edwards in director John Ford's masterpiece, The Searchers (1956). Red River ends not with a bang, but with a whimper. In a change from the source material, Dunson and Garth are persuaded to lay down their blood feud after a stern talking to from Tess. The trio ride off into the sunset where presumably Tess and Garth will marry, and Dunson will become a doting grandfather to their passel of children. This seems as likely a turn of events as any other -- Hawks' movies were never exactly cinema verite -- but I've always wondered what would have happened to Dunson once the credits roll. Would he settle down to a life of domestic bliss, or would he set by the fire plotting and planning until one day he would have his vengeance? Here's a clip of director and film historian Peter Bogdanovich discussing Wayne's performance in Red River. Red River is available on DVD and Blu-ray from the Criterion Collection. My sources for this article are John Wayne: The Life and Legend by Scott Eyman and The Western: The Complete Sourcebook by Phil Hardy. Go here, for articles from past blogathons I have participated in. Yup, this film does end with a whimper, but I also wonder how Dunson will eventually live out his days. This is one of my fave John Wayne performances, and I'm glad Hawks talked him into taking this role. 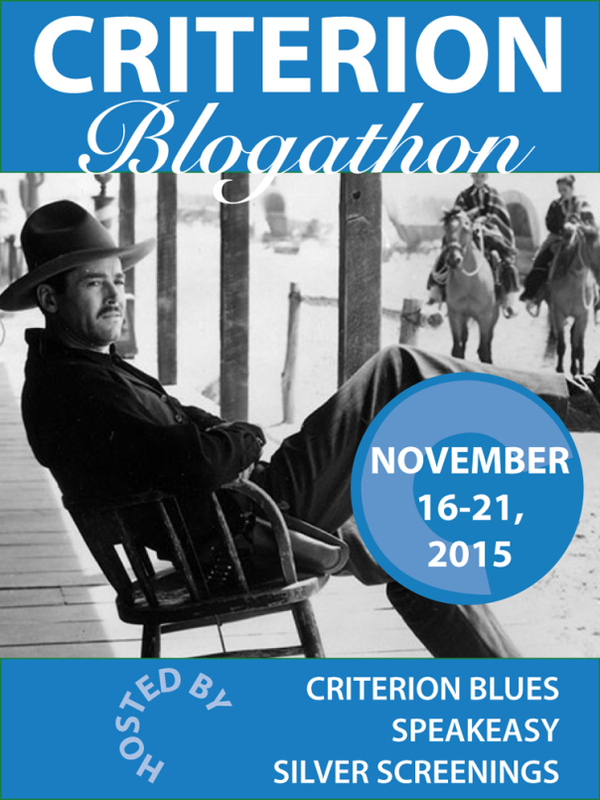 Thanks for joining the blogathon – and for bringing John Wayne to the party! Seriously, Thomas Dunson, control freak of the old West, is not going to set around whittling while somebody else runs his ranch. Thanks for taking the time to read and comment. I know you're really busy this week. The first time I saw "Red River" I was so disappointed by the ending that I didn't watch it again for eons. In recent years I have grown oddly fond of the ending as it stands. So much like real life - men make a big fuss about something and a woman has to put them in their place! LOL. Yes, there was too much macho on the cattle trail. It's only recently that I began to really appreciate westerns (maybe because my father liked them growing up, and it takes maturity to appreciate the things our parents like). Now that I'm more accepting, I'll have to add this to the list. Thanks for the review. I love Westerns, even the silly TV shows like Bonanza and The Rifleman. One of the things I appreciate about Criterion is that they have added a few like Red River and Stagecoach and My Darling Clementine to their collection so people can appreciate a great American art form. Now I'm imagining how Red River would be with Gary Cooper playing the lead. I love Coop, but I don't think it would have turned into such a powerful movie. And it is also great to analyze it among Hawks versatile body of work. Very nice review, congratulations. Inside my experience, it's the rare Filipino that doesn't have a nick name. More information on Thriller | Watch Movies Online For Free - Fmovies - Fmovies.accountant click here.